Fig. 1 SWEEPER is a harvester mounted on a platform able to move independently. The heart of the harvester is a robotic arm that ends with a gripper and a cutter. 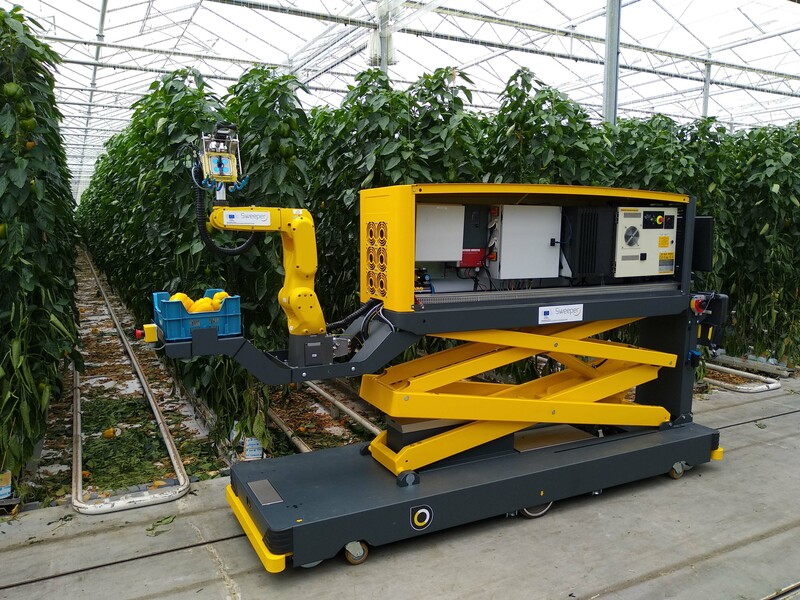 The SWEEPER project, funded by the European Union, proposes a first-generation robot for harvesting sweet pepper in greenhouses. SWEEPER is based on a previous project – CROPS – funded by the UE as well. 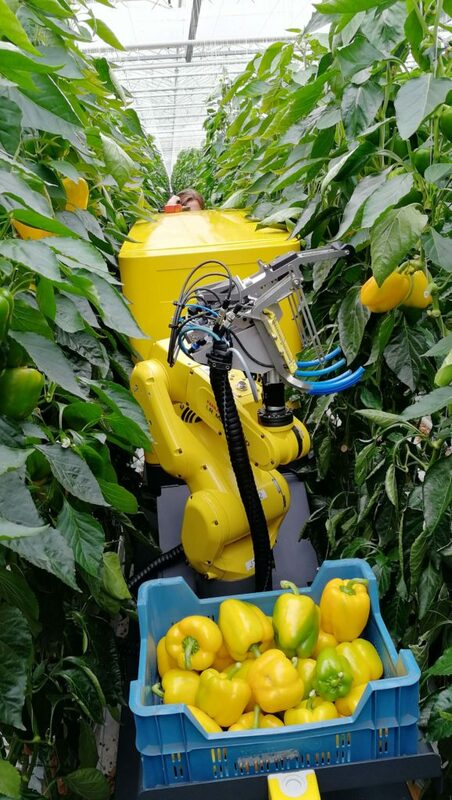 In the CROPS project (www.crops-robots.eu) extensive research on agricultural robotics was carried out and the partners developed a prototype of sweet peppers harvesting robot and patented a gripper able to grasp and slice peppers. The CROPS system is able to perform also other tasks, such as the harvesting of apples and grape. SWEEPER used the technology developed in CROPS to introduce, test and validate an automatized harvesting solution for the sweet pepper closer to real conditions, improving its performance and efficiency. These are in fact the limits of the automatized harvesting prototypes so far developed. They are slow – require 94 seconds per piece – and have a success rate of about 33%. Moreover, they are not solid enough, are difficult to control, and they are not sufficiently integrated into the post-harvesting logistics. SWEEPER is a harvester mounted on a platform able to move independently. Its heart is a robotic arm, able to move even in limited spaces, such as cultivation inter-rows in greenhouses. A metal gripper mounted on its ends and resembling a spoon shaped hand with camera and sensors in its palm and with metal fingers, is able to uphold peppers removed from the plant. Camera and sensors, equipped with a complex 3D vision system, can recognize position, distance, color and degree of ripeness of the peppers. Camera and sensors are not affected, while they are working, by the light of the surrounding environment. The robot has been programmed so as to be able to detect obstacles such as leaves and stem and to distinguish between them the fruit. The ripeness of the peppers is measured according to a colorimetric analysis of the base of the fruit itself. Once the fruit to be picked is identified, the robotic arm moves towards the pepper frontally, thus with the peduncle on the opposite side. A cutter cuts the peduncle and the fruit falls between the fingers of the gripper which places it in a particular collection basket. This via a track system or by an independent driving system is carried to the collection point. Sweeper uses the tested hardware and software applications developed in CROPS, based on the robotic operating system (ROS). The gripper collection system too has been maintained and is patent pending. Based on the intuitions of CROPS, the sensors have been positioned only on the gripper. A plenoptic camera is able to record at the same time both color and 3D information. SWEEPER robotic arm is a good example of what can be done thanks to the introduction of 4.0 components in agriculture. 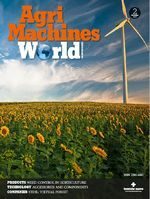 The development of advanced sensors allows robots almost to see the fruits and decide whether collect them or not, activity formerly impossible, but key for the automation of the process. Fig. 2 SWEEPER is able to move even in limited spaces such as greenhouses crop inter-rows. SWEEPER has been designed to operate in a single row cropping system and, ideally, for pepper plants suitable to automated harvesting, namely with single fruit (not in cluster) and a few leaves. These are characteristics that most of the commercial species do not possess yet. This is the reason why during the SWEEPER yield tests, some plants have been manually “modified” (elimination of fruit clusters and some leaves) in order to make them more suitable for automated work. The yield of the robot was therefore compared both on these “modified” plants and on non-modified commercial plants. According to the project partners, the results are “more than satisfactory”: on the “modified” plants suitable for work automation, a harvest success rate of ripe fruits of 62% has been achieved, that is to say 4 times higher than the reference prototypes yield. In non-modified commercial plants, the success rate was 31%. The harvest times too have improved very much. Sweeper takes 24 seconds to harvest a single fruit in greenhouses tests, but according to laboratory tests, making the robot work to its full capacity, 15 seconds/fruit may be reached. The results of SWEEPER are therefore encouraging and represent a further step towards the maturity of the market of this kind of machine. Some aspects are still to be improved, both in the machine and in the choice of the crop systems and the varieties to be used. As an example, the movements of the automatic arm can be sped up and made more precise, thanks to the introduction of more advanced pneumatic automation systems. The same applies for sensors that identify the fruit and its degree of maturity. Consideration should also be given to the adoption of single row crop systems, more suitable for automated harvest as they increase fruit visibility and accessibility. Finally, the choice of varieties most suitable to automated harvest would further help an increase in the yield of the robot. SWEEPER was designed for the harvesting of peppers, a high value cultivation with a production in Europe estimated at around 1,9 billion kg per year. Nevertheless, technology can be easily modified and transferred to other crops such as apples and grape. The project partners are convinced that robotics and sensors in the not-too-distant future can allow to carry out many activities for the harvesting which are unthinkable today, such as for example to detect the vitamin content, levels of sweetness, the expected shelf-life of the fruit and the capacity to provide in advance crop disease alerts. All thanks to the combination of advanced mechanics and sensors. it is the industry 4.0, that heavily and irrevocably advances also in agriculture: it is agriculture 4.0! The SWEEPER project involves 6 partners from 4 different countries (the Netherlands, Belgium, Sweden and Israel). The consortium is composed of basic and applied research organizations, a systems integrator and a modern sweet pepper farmer. The consortium brings together a wide range of disciplines, including: horticulture, horticultural engineering, machine vision, sensing, robotics, control, intelligent systems, software architecture, systems integration and greenhouse crop management.